Come and take a trip on the Pride of Batchworth! 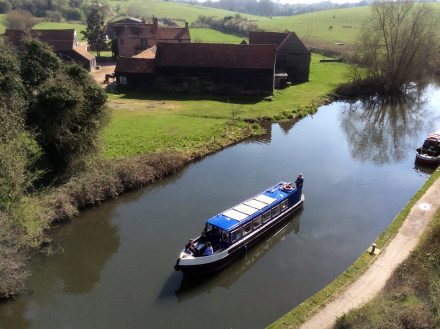 Our purpose built trip boat has the capacity for 12 people and runs regular trips from the canal centre at Batchworth to Stockers Lock and back. Or you may wish to privately charter the Pride of Batchworth complete with 2 fully trained crew for special occasions. Combine a perfect day out with a trip on the famous Grand Union Canal. Our experienced volunteer crew will take care of your every need leaving you, your family or friends to just relax and enjoy a fantastic day. The Pride of Batchworth offers trips from Batchworth Lock to Stockers Lock and return. A round trip takes around 30 - 40 minutes. As long as we have a qualified boat skipper available (and there usually is one) boat trips can take place on demand in all weathers - except when the canal is iced over! Trips are run on a ‘turn up and go’ basis. Although the boat normally runs between the hours of noon and 5.00pm, please phone 01923 778382 beforehand to check the boat is available if you are making a special journey. It may have another commitment. We also offer a private charter service on the Pride of Batchworth for up to a maximum of 12 people. Boat Charters can be booked throughout the year on any day of the week subject to arrangement and sufficient notice. For all charter bookings and further information on charters please contact canalcentre@rwt.org.uk. If you just want information on whether the Short Boats Trips are running on a particular day please call the Lock Centre on 01923 778382 as the email is just for Private Charter enquiries. To find out more about Charters and see suggestions for 1 - 5 hour return trips download our Charter brochure. Another option is to book a return trip to the Coy Carp at Coppermill Lock where you can enjoy a meal, the boat will wait for you and return you to Batchworth. When booking please allow 2.5 hours for the return boat trip and add on the amount of time you wish the boat to wait for you while you dine. Please give two weeks notice to book a charter as we have to ensure we have the volunteers available to crew and this is not always easy to do at short notice. We can accept cheque, debit or credit card (not American Express) or cash payments in the Lock Centre. "What a fantastic day we had on Saturday, as you predicted the sun shone for us, everyone was in jolly mood and everything went to plan. Unfortunately just one of the lads was unable to come after all but all those who did had a great time. Thank you and all involved for the hard work that goes into this sort of thing - I hope we will be able to do it again sometime." "I just wanted to say a big thank you for yesterday. The canal trip was perfect and they were great, friendly and informative .... all my party asked me to pass on our thanks and to give positive feedback. I believe people don't comment enough when they're happy with things but all too quick to complain. And you were right about the weather." "I would like to thank Graham & yourself for super trip out. I had fabulous time & so did girls. You both helped make our day enjoyable & informative. I loved doing locks & learning about the rope marks with horses and the coal tax plaque & house. I will write up a review & put your details on face book as social media is great advertising. I know at least two of my ladies are interested in booking barge trips with you. Thanks again for super day." "I am writing to say how pleased my husband and I were with the cruise on the Pride of Batchworth last Sunday. Three generations of our family all enjoyed themselves very much, and one grandchild to day requested to repeat it another time. Thank you to you, David, Graham and Chris and others of your team whom we met, for a very well organised and efficient event, particularly teaching the four children how locks operate and encouraging them to help. I thought the boat was very well equipped and just right for the occasion. As we also experienced fine warm sunshine for much of the trip, it really was a most successful 50th birthday celebration for our daughter. Thank you all very much." "It was the unanimous view of everyone in my party that it was an excellent day out last Thursday. Thank you to you personally for all your help both in our arrangements and on the day in showing us over "Roger". Please pass on our thanks to all your fellow Trust volunteers and especially our crew for making it such a successful occasion. The Queen's Award is fully deserved!" "Just to say how greatly we enjoyed our trip on the Pride of Batchworth yesterday. Chris and Fabian worked very hard on what must have been the hottest day of the year - and we sat back and enjoyed every minute of it. Thank you again." "I just wanted to send a note to say thank you for a lovely afternoon boat trip on Monday. My mother had a wonderful time and the whole family enjoyed it. Thanks to the volunteers who were great too, very entertaining and knowledgeable." "A big thank you to the crew and you for a wonderful time on the canal. The weather was a bit on the wet side, but everything else was perfect! Please pass on my thanks as we dashed a bit for cover, and didn't say it properly to the people involved. We will definitely be back another time." "We had a wonderful afternoon out today. Of course the weather helped but the boat was perfect for the twelve of us and Steve and Chris could not have been a better crew. We brought a picnic and it was lovely to have tea and coffee at the end of the meal. I shall be recommending you to all my friends." "On behalf of myself & all who so enjoyed yesterday afternoon’s trip. I should like to thank the crew & all those who made the trip so memorable. I am sure we will coming back for more." "Once again the family had a very enjoyable time on 'The Pride of Batchworth' yesterday. Many thanks to you for making the arrangements - and to the crew for working so hard on a hot afternoon!" "I just wanted to say a big thanks for a lovely day, nice friendly people and crew such a credit, an amazing place you have there, we will definitely come back again. My mum loved it. Thank you all for making her birthday special."